In partnership with ASUS we are proud to announce our new range of AMD powered systems featuring the new Ryzen 2 APU's. great gaming performance on a budget. We have put together a range of systems featuring ASUS’s award winning motherboards. With a combination of entry level and overclocked PC’s providing great gaming performance on popular games such as Rocket League and PlayerUnknown’s Battlegrounds. These new systems from AWD-IT are perfect for new and existing PC gamers alike. Aimed for the upgrade market, their gaming performance can be greatly increased in the future by combining the powerful AMD 2nd generation Ryzen CPUs with a dedicated graphics card. 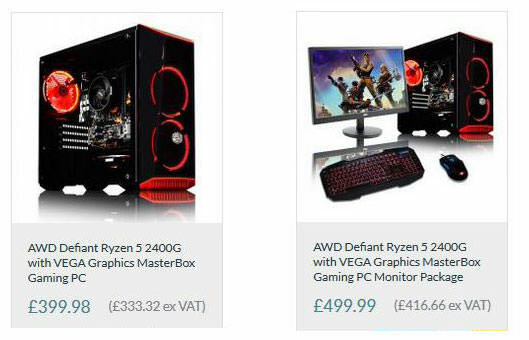 So to combat the price increases and shortages in graphics cards, AWD-IT and ASUS are offering a £20 voucher with each system to spend at AWD-IT.co.uk, to allow gamers to upgrade to a new graphics card in the future as the mining constraints drops. This represents a great opportunity for gamers to avoid graphics price increases, while upgrading their system and benefiting from the latest ASUS and AMD components. The Ryzen 5 2400G features 4 cores and 8 threads, and by overclocking the CPU, integrated graphics and the 8GB of RAM with an ROG Strix B350-F Gaming, the system can steadily achieve constants of between 40-60 frames per second on PlayerUnknown’s Battlegrounds at 720p at medium settings. With a Cinebench score which ties with Intels 4770K, plus we also saw some ultra smooth gameplay in Fortnite and Rocket League.